whr can i find that? does this url http://192.168.1.1/main.html not work for your Wi-Fi router? What url do you normally use for configuring the connection? well i have a beetel 220bx adsl modem and on opening its setup page no NAT option is visible and neither Advance Options.Only WAN and LAN options are visible. can anyone tell me the link. i m using BSNL broadband. Wow ! I've searched far and wide for a way to do this. I had almost consigned myself to the conclusion that it just wasn't possible, given the fact that ISP's in India don't allot public IP addresses. My only lament is that I found your blog so late ! Thanks a ton, buddy ! You rawk ! So does anyone know how to configure Beetel 440TX router for port forwarding? I too replaced my 220BX router with Beetel 440TX1 Wi-Fi router from Airtel but I can't find the advance settings. It seems telnet access to this router is also blocked. The same login name and password works for the html access, but in telnet access, after entering the login name, it prompts for the password but I am unable to enter any character on the keyboard. When I enter the password (it does not echo on the screen) and press enter, it says "Incorrect Login". I am also using Beetel 440TX from Airtel and not able to do port forwarding on that. http://192.168.1.1/main.html does not work on this and http://192.168.1.1 does not have NAT configuration. Please help. Click the "Advanced" link.click on the link titled "Port Forwarding".If you get a message asking you to specify an ip address before proceeding, do this. Click on "LAN Clients -->Select LAN Connection should be LAN Group1 --> Under Enter IP Address, enter your own ip address. Now on Port Forwading page select the "user" radio button and click on the "New".Under rule name you can give any name. Under "port start" enter the first port number you wish to open and "port end" specifies the ending port number. The "port map" should contain the same port number as what you entered in "port start". Once this is done click on apply and go back to the previous page. Now check the "user" radio button, you should now be able to see the newly created rule. Select the rule, click on "Add" and click on "Apply". Now on the top of the page click on "Tools", and then click on "System Commands"
No it still does not seem to be working on my 440tx. Have you tried it out for UTorrent ? I am having Beetle 220Bx ADSL Modem with Airtel DSL 24hrs Unlimited. I have forwarded port 21(FTP) on it after reading the instructions on your blog. I want to setup a personal FTP server so that I can connect to my pc from anywhere in the world through the FTP protocol. I have forward the port.. now what shud I do??? There are lots of free ftp servers available on the net. Check out http://www.portablefreeware.com/?sc=92 for a few. I have downloaded the Quick 'n Easy FTP server... and created an account on dyn dns.. my up address is mapped to a regular host name. but i am unable to connect.. i have forwared the port on my router and also added a ftp port in the windows xp firewall.. please help..
Whew! Thanks for that info Yogi. I was getting damn annoyed that the router didn't seem to have an option to configure a DMZ or port forwarding. And Airtel tech seem to either not know this info or think you're too dumb to be allowed to know this. No, port forwarding is still not working on my 440tx. under Lansetup configuration the port forward service is not at all there. I know this may not really be relevant in this post...but it'd be great if you could help me out! I am using 220BX adsl 2+ modem with bsnl dataone...when i switch on the modem and go to 192.168.1.1 - it says the page cannot be displayed...i followed your tcp/ip settings and checked my browser settings...really at my wits end. open cmd prompt. type ipconfig. Using this setting can i connect remote desktop..I'm unable to connect remote desktop sitting over USA. How do i connect to my friend. She's very "0" in networking. This is not related to this article though. I turned off the DHCP using the telnet option and am not able to access telnet or using the http://192.168.1.1/main.html link. can you tell me how to turn on DHCP? 3.i have read ur 1st post.. to connect to router..although understand bt thinking will it affect my current settings. you don't need to buy the router. I think the rest of the questions automatically get answered with this. i have configured my airtel conn. through wireless which is connected to beetel 220 bx modem. If i want to port forward now what do i do? I think that some people need to note that you need to log on using a computer that is connected via wired LAN & not Wi-Fi. The URLs specified here work perfectly. Thanks yogi, for that last URL. I really needed that. i tried to forward my port according to your instructions. But when i tried to access http://192.168.1.1/main.html, it is prompting a window which states that requires a user id and a password. how to go about it? Thanks for the info .. I have a linksys wireless router set up for wi-fi with the airtel beetel modem. Just wondering how do i port forward for this scenario? Hey Thanks, this is brilliant. I had no idea the real router functions were hidden behind that /main.html url ... I just thought I was stuck with the worst router on the face of the planet. I had one question: Do you know of any sort of TCP connection limit built into the 220bx? any suggestions on configuring it using netgear wg614v5 router which has the airtel id and password fed in its setting for connections.. its been 2 weeks and i have not found a solution even though ive tried every trick in the book..
http://192.168.1.1/start.htm doesn't get u the settings page? kindly give me the steps.. I did all the steps you suggested for port forwarding. I even upgraded firmware and rebooted the modem. the inbuilt ftp client says connection refused. Am I forgetting any step. But, awesome tutorial, thanks again! thanks a lot man, I am able to see the green light in utorrent now and its downloading very fast now. thanks a zillion. Good stuff.. it should work even if you have wifi router in place..
That's it.. the things should work smoothly as they worked at my end. Do let me know if you want me to explain the stuff in detail. Thank you. it has helped me a lot!!! i have a beetel 440 tx1 modem . It doesnt have the advanced tab in the configuration page . Dude! You ROCK. Thanks a bunch. How do I handle port forwarding if I have a 220BX set up with a linksys wrt54g router?? Thanks man ... no one could have made it simpler ... it was so damn easy... ive read other manuals and suggestions and methods .. but none of them were said so simply. i need ur help man...!! but im not able to open the page http://192.168.1.1/start.htm to edit the advanced menu..! whats the username n password..? im not able to go thru tis part..! i ve gone thru that part sanjay...!! i use Bit torrent so i used ports btw 6881 - 6889..
but still my torrent shows NAT reachablity pblm...! i cant go thru NAT test in the options menu of my bit torrent..! "Testing port 6882 ... Unable to test: Invalid port given, or test service failed. Another application may already be using this port." i have a 110BX modem and i followd all the steps given in ur blog but my utorrent starts giving a ! sign instead of the normal delta sign. i am unable to get the port forwarding working. Thanks! I was able to do the port forwarding for μTorrent. A very strange prob here. My port forwarding works for utorrent but not for any other server (such as apache). It was working till a few days back, but then my comp crashed I reformatted (so nothing changed on the router settings). Any ideas? Also I can't access 192.168.1.1. Any guesses what the modem IP address might be most likely? I've been tryin to fix my Beetel 200 BX modem for a while now, without much success. I had intermittent connectivity problem with my Airtel broadband and the tech guy came and upgraded my modem's firmware. Now that this was done, I was having a LOT of port problems. Every other application was refusing to connect, such as Limewire and Azureus (which said it'd been firewalled). I wanted to do some port forwarding and surprise of surprises, I have been unable ABSOLUTELY to open the modem settings page. I use a Netgear WGR614v6 router and I'm able to access the router settings page on 192.168.1.2, which is the address we have assigned for it. i WAS able to access the Beetel modem settings page too previously on 192.168.1.1, but now that does not seem to be working at all. Any clue on what has happened? How do I figure out the address to access the modem settings? what do i do to forward ports if i also have a wireless router??? you're a star, mate! worked like a charm. i'd been banging my head over this for quite a while now. many thanks. I am having Airtel BB but modem is HUAWEI (SmartAX MT880). The procedure said by you goto Advanced>>NAT>>Virtual Servers. Such an option isnot available with me. Options available to me under Advanced are :- RIP/Security/Firewall/Filter/QoS/TimeZone/ACL/TR069/UpnP.. thats all. I hope you have got my concern. I request you to help me for port forwarding. 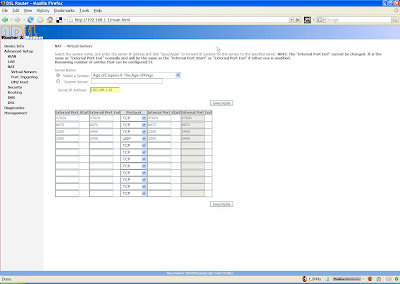 In HUAWEI SmartAX MT880, NAT is in "other settings"
Check out http://portforward.com/english/routers/port_forwarding/Huawei/SMARTAX-MT-800/Azureus.htm for more details. 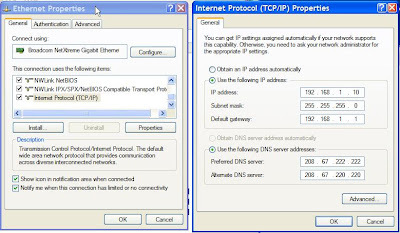 Mr. Raman Can U please tell me how to configure static ip in beetel 110tc1 ADSL2+ router. 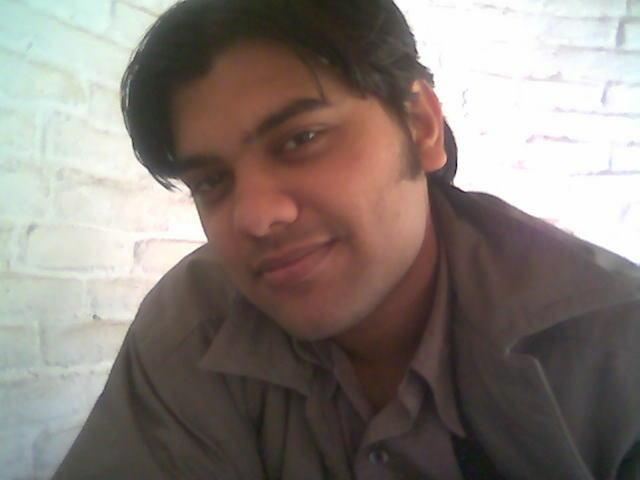 Kindly mail to my email address: umapathig_1985@yahoo.co.in, I'll be thankful to you, if you do it for me. Mr. Anonymous in Beetel 220BX1 there is no NAT option available. Either u need to upgrade its firmware or u need to shift to Beetel 110BX1. Speak to your ISP. Can anyone tell me that, how to configure static ip in Beetel 110tc1 modem. Unable to configure through static nat method. But it is working in bridge method. Please help me? I have just bought a laptop and I am considering getting an Airtel Wireless Connection for broadband unlimited internet connectivity for both the laptop and my PC. When I visit the Airtel website I notice that they have mentioned 4 different devices Airtel 3G, Edge, Micromax 300G and 200G. However, on speaking to the customer care, they mention Wifi 440 and 450. What is the difference between these and which one is most recommeded? I just want to know how to set up Beetel ADSL 2+ router (from Airtel Broadband) 110TC1 with Belkin N wireless Router (F5D8233). I need the configuration to be done urgently as I need to service my clients ASAP. Thanks in advance for any help! How does one disable remote configuration of a modem? 1. Beetel 110bxi connected to the Airtel ISP. 2. My IP Address is dynamic. 3. I have configured the modem with dynamic dns. 4. I have done the port forwarding stuff. When I access the IP address from the internet, I see the dialog box where a user has to log in to configure the modem. I want this to be turned off (Don;t want the world to try to log in and change my modem settings). I am unable to find the option in the modem that needs to be selected / set to turn this off. Is it possible to configure static nat in Beetel 110TC1. @Saurabh you cannot assign a static IP to your router. This is because it is airtel who assigns the IP to the router, and you have no control over that. You can, however, use dyndns.com to assign a name to your router and then access your machine over the internet.